The weather did make for some challenging driving conditions last night, furthermore Shawhaven was forced to close Wagons of Fear and Dead Maze, but all things considered it was still a worthwhile night of haunting that began in Mason and ended in Jackson. Samara’s Boarding House at Shawhaven and Jackson’s Underworld were both enjoyable in their own right but it would be Awaken that captured my imagination and stole the night! Samara’s Boarding House featured several captivating scenes inside of a curious series of buildings, my personal favorite was an intimate movie theater and a mirrored hall trimmed with red lasers. Awaken, the brand new haunted attraction in Leslie, Michigan, impressed us with a large cast and immersive scenes that included an ominous funeral parlor and riveting carnival! Jackson’s Underworld had excellent presence and scenery although most of the actors were pedestrian at best. The new secondary attraction, Psycho Vision 3D, featured awesome artwork and other visual splendor. Thanks to Tammy at Shawhaven and the tandem of Rob and Brian at Awaken for being gracious hosts and all-around fun people to talk haunts with. Full reviews of each attraction will be posted soon. Turn the Page, It’s October! The open road beckons as we commence the 2016 haunt season. If all goes according to plan and the weather is cooperative, we’ll visit three of Michigan’s scariest places for a total of six attractions. First, we burn rubber to Mason, Michigan which is home to Shawhaven Haunted Farm. A trip here has eluded us in seasons past and I’m pleased to finally have it penciled in with priority. 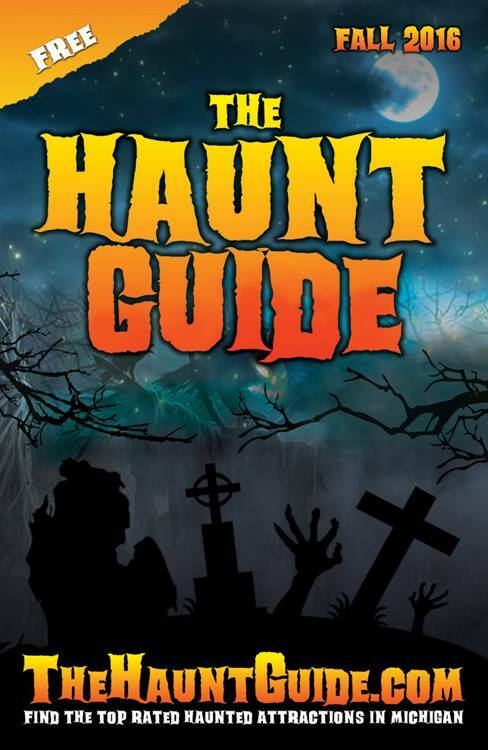 Shawhaven offers three haunted attractions — Dead Maze, Wagons of Fear and the headliner, Samara’s Boarding House. If time does us any favors we might just check out one of the Escape Rooms too! Once finished there, we make the short drive to Leslie, Michigan where we will experience a tantalizing new haunted house called, Awaken. The website for Awaken is full of content and I appreciate the effort that has been made on social media to promote the attraction. The theme has remained something of a mystery to me — disparate photos on Facebook have revealed a funeral service, barbershop and the possible presence of a circus. Yeah, I’m sold. I can’t wait to see how it all blends together. Our last stop of the night will bring us back to Jackson’s Underworld which we have visited twice previously, first in 2009 and again in 2013, each trip yielded very different results. I’ve heard nothing but great reviews since our last stop three years ago and now there’s also a second attraction entitled, Psycho Vision 3D! I fully anticipate a highly satisfying night of haunting! As with any season of haunting changes to the schedule are inevitable and 2015 is no exception. What I have posted below is an ambition if not all together insane flight to the finish. The haunt season has concluded with a flurry of activity in years past but the 8-night, 15-haunt gauntlet listed below is the stuff of madness. It may prove to be too ambition in the end; I may be found on November 2nd lying face down in a corn field with frayed nerves and a vacant expression, but damn it, I’m going down swinging. And if all that doesn’t kill me I might just attempt to hit Scarefest Scream Park which will be open on Saturday, November 7th. Why? Because haunts.